Don’t forget to Tweet or Facebook your PJ pics with #weonePJday to win a group prize worth over $3000. Winner will be drawn on March 1st. (8:15am- 9:00am) Breakfast TV Live! Get your mug on TV and support the cause in your PJ’s. 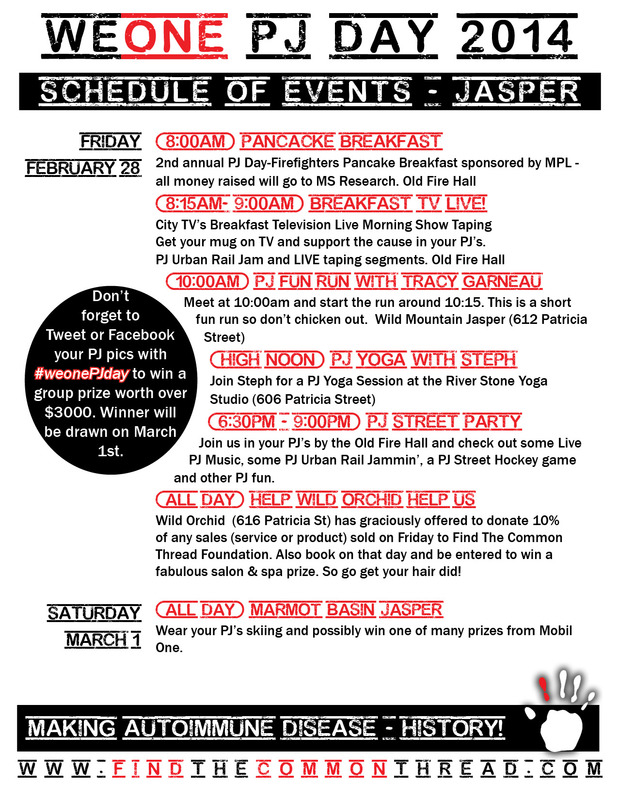 Join us in your PJ’s by the Old Fire Hall and check out some Live PJ Music, some PJ Urban Rail Jammin’, a PJ Street Hockey game and other PJ fun. Wild Orchid (616 Patricia St) has graciously offered to donate 10% of any sales (service or product) sold on Friday to Find The Common Thread Foundation. Also book on that day and be entered to win a fabulous salon & spa prize. So go get your hair did! Wear your PJ’s skiing and possibly win one of many prizes from Mobil One.